Are you looking for what causes Congestive heart failure in person, then let us first few things about this heart disease first. Congestive heart failure is generally develops after some other conditions result in the damage or weakening of the heart. Nevertheless, a weak heart is not always the cause of heart failure. Heart failure can also happen if the heart gets very stiff. Congestive heart failure is blood congesting or backing up in the abdomen, lungs, lower extremities and the liver. All sorts of heart failures do not tend to be congestive. Individuals might experience weakness, or shortness of breathe because of heart failure. CGF or congestive heart failure is a progressive condition affecting the pumping power of the muscles of the heart. This condition can be life-threatening and therefore immediate medical help in always recommended. 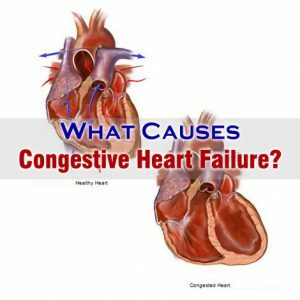 So, What Causes Congestive Heart Failure? When the blood pressure of an individual is higher than normal, it might result in congestive heart failure. Hypertension generally results when the blood vessels get restricted by fat and cholesterol. This makes is difficult for blood to pass through the blood vessels. Fatty substances and cholesterol can block the coronary arteries that supply blood to the heart. Coronary arteries are generally the small arteries supplying blood to the heart and when these arteries get blocked, they become narrow restricting the flow of blood and resulting in heart failure. The heart valves regulate the flow of blood through the heart by closing and opening allowing blood in and out of the chambers. The heart valves that do not open and close normally might force the ventricles to work harder in pumping blood resulting in heart defect or infection further causing heart failure. Damage of the heart muscles due to infections, diseases, toxic effect of drugs and alcohol abuse can also serve as one of the major causes of congestive heart failure. Abnormal heart beat or irregular rhythm of the heart can lower the effectiveness of the heart in carrying out the procedure of pumping blood. This also causes congestive heart failure.